We asked which of a range of facilities needed improving. 97% of people answered this question. A 39% majority thought that banking and post office facilities needed improvement. The impression given by additional comments written on paper forms was that it was the banking that needed improvement rather than the post office, but regrettably our poor design of this question prevented a clear view from emerging. We asked how important each of several institutions were to the town. This was not a good question as all institutions came out as important but, schools stood out as the most important (87% majority). The 255 ‘votes’ for the schools being very important to the community was the single biggest vote in the entire survey. Neighbours, pubs / cafes and festivals and town events all had a majority of around 80% seeing them as important. The survey underlined the importance of The Dove to the community. It was the most commonly mentioned means of keeping up to date (82% of respondents). Talking to friends and neighbours was second (73%) and notices in shops and on boards third (56%). Young people used social media more than any other means of keeping up to date. Use of social media dropped off with age but was still mentioned by 50% of 60 to 64 year olds. For anyone aged 30 and over The Dove was the preferred means of keeping up to date. 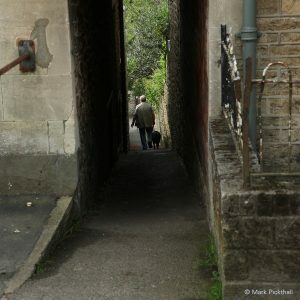 The survey ended with two open-ended questions: people’s favourite thing about living in Bruton, and the one thing that needed to be improved. These two questions were by far the most popular open-ended questions in the survey, each answered by nearly 300 people. It was very clear that Brutonians value other Brutonians: 116 people’s favourite thing was either their friends or the town’s friendliness, and ‘community’ was the next most mentioned theme with 74 mentions. People also felt strongly about the local countryside, mentioned 72 times, and the size and ‘just-right’ character of the town was mentioned 56 times. The “one thing that could be improved” was most often the traffic: the word ‘traffic’ was mentioned by 48% of the people answering the question. People wanted less and slower traffic (66 mentions). They also wanted wider pavements and safer walking facilities (31) and better parking (23). About one in nine people (11%) were concerned about gentrification, second homes and the town in consequence offering less for its locals. No other issue was mentioned by more than 5% of respondents. When compared with the 1996 and 2010 surveys, which both had questions about crime, it is noticeable how little crime was mentioned in response to this question. The word itself does not appear in any reply. Police/policing was mentioned twice, and drugs twice in 293 answers. The action plan following the 1996 survey argued the need for CCTV for the town. The lack of concern about crime in this survey may be a sign of something that has changed for the better in the intervening two decades. To return to the highlights click here.